1. Preheat the oven to 190ºC, gas mark 5. Rub the pork with 1 tsp oil and sear all over in a hot frying pan until brown. Place on a foil-lined baking tray and sprinkle with the grated zest of 1 lemon, mixed herbs and seasoning. Roast for 25-30 minutes or until cooked through. Remove to rest, then slice into 1cm-thick rounds. 2. Heat 2 tsp oil in a pan and add two-thirds of the garlic and rosemary, cook over a low heat for 5 minutes. Add the beans and cook for 5 minutes. Mash with the zest and juice of ½ lemon, mustard and stock until smooth, then season to taste. 3. Heat 1 tsp oil in a pan and fry the remaining garlic and kale for 4-5 minutes until wilted. 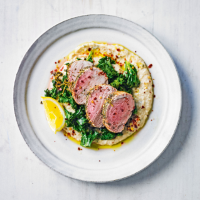 Serve the bean mash topped with pork slices and kale. Add a pinch of chilli flakes, then drizzle with olive oil and serve with lemon wedges, if desired.